Loving getting snail mail. I know the sound the fed ex and UPS trucks make as they turn the corner and put on the breaks. I know exactly what time the mail man comes. I like to be the one that gets the mail. Packages and parcels just make my week. And of course I love pretty boxes from stitch fix. This is actually my second one this month! From first view out of the box I was pretty excited about everything. The fit is great on all of it. I think I'm definitely keeping the funky tabsleeve blouse. It's versatile for dress up or down and a good transition piece for spring. I'm debating the chambray. Fits great. Love the polka dots. No brainer? Should I keep it? Love the colors and texture on the tank, but I think I'll hold out a bit before I add to my tank collection. Thoughts? What would you definitely keep if you were me? and i'll be totally honest with you (i've shared details before)... stitch fix has an awesome referral program. so if you sign up for your invite with my link, when you order your first fix I get $25 stitch fix credit!! pretty sweet deal. I tell you this for two reasons: 1. duh, i love stich fix credit and 2. once you sign up, you can get your own referral code and start earning referral credit too!! The Tulle top is adorable! And I know how you feel about Tulle :) Also the graphic blouse looks amazing on you. Keep it! Wow, that blouse is really cute on you. I totally scrolled passed it but then had to scroll back up to see if it was the same one. The Chambry and heart print top are my favorite. Stopping by from WWIW. dream job: being a stitch stylist. i feel like it would be so fun! I agree with Erika, that would be such a fun job! I love the heart tank top and the polka-dot chambray! I love the polka dot button down! So sweet! What a beauuuuuttiful selection!! It would be hard to send any of these back! 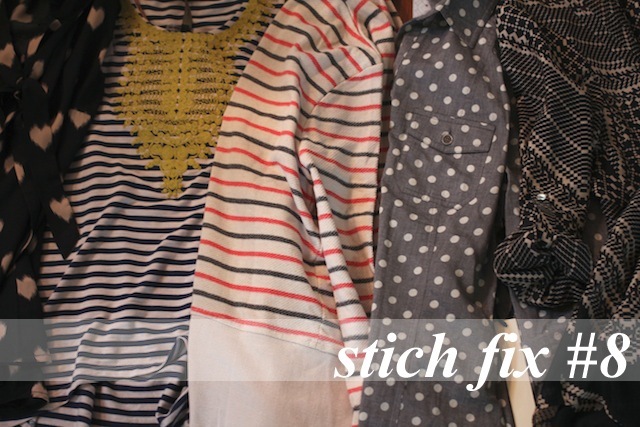 you got such a cute stitchfix!!! 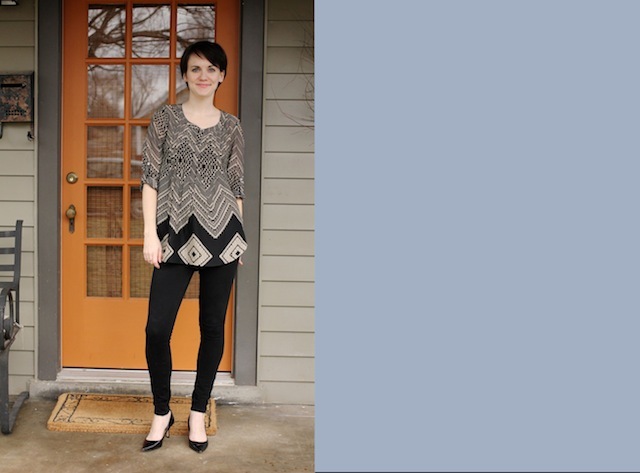 I totally just added the link to this post to my stitch fix profile! What a great collection you received. I would have a hard time not keeping it all. I'm loving that heart top! I always fear the "ugly Christmas sweater" effect with holidays, but I still want to wear something *festive*... I think the heart top works - cute, but understated, and you can wear it beyond V-Day! I LOVE the tank ... definitely keep it! Just think how cute it will look with some khaki shorts and a bright pair of flats or sandals in the summer! LOVE THE TANK! keep it!! I would have kept all of it I think! LOVE! I'm trying to figure out cost! From their website I understand the styling fee and that you get 25% off if you keep anything, but can you tell me what you spend on average monthly? Thank you! Whatever is the most unusual for your closet, I'd go with something that's unique for your wardrobe. I will, however, say that I have a polka dot chambray and totally love it. Did you send the tank back? I just got it in my fix! Not crazy about the "trapeze" cut at the bottom but I kept it because it looks good tucked in a skirt. I did. Liked the colors but was too small for me a bit and I'm only getting bigger. ;) (15 weeks preggo).